apart from identifying individuals on pictures like these I would like to know if there is a systematic way of how these men were placed in pictures like this. Does anyone know this? The simple answer is I don’t think we know – the obvious assumption is that the boys will probably stand together as crews – having said this, this grouping might not necessarily be in a single row per se – if you look at the ‘B’ flight photo from 1945, you will see the Zinzan crew (my fathers 2nd tour crew) standing together, but spread through a number of rows. Until individuals are identified and their crews therefore ascertained, it’s difficult to know the associative relationship on any individuals in the photographs. I have thought that as we identify crews, I might reorder the lists below the photo to group individuals within crews, irrespective of their numerical order or position within a photograph. It might be that your father and his crew had gone to No.3 Lancaster Finishing School when the photograph was taken, as part of the Squadron’s conversion from Stirlings to Lancasters. 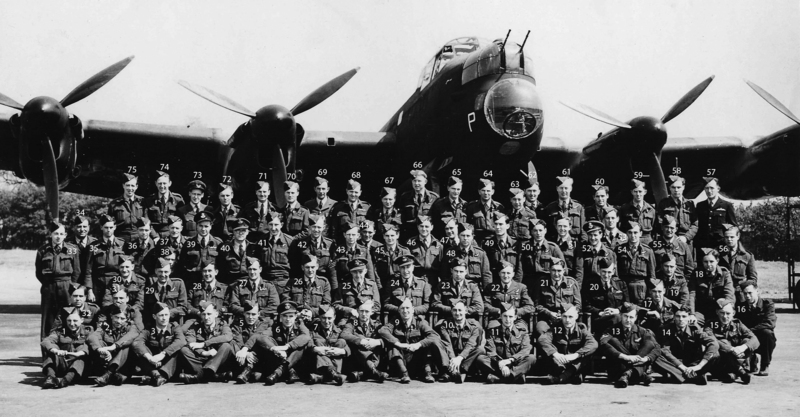 Prior to the Squadron converting to Lancasters, Group deemed the Squadron too exposed to continue to participate in main bomber force Ops, in the now relatively aged Stirling, so the Squadron switched almost exclusively to Mine laying and ‘Special Operations’ – these Special Ops were dropping supplies to French resistance and SOE I understand. The signature may possibly be S/L Euan Sachtler. Are you aware that there is a educational project on Gordon on the National Archive website ?!? – I assume its your Father…..
21. P/O Glen Osmond Marshall, RNZAF NZ416011 – Wireless Operator. Witting crew. 24, F/Lt. Eric Francis Witting, DFC, RNZAF NZ415212 – Pilot. 25. F/Lt. William Edwin ‘Ted’ Anderson, DFC, RNZAF NZ416073 – Navigator. Witting crew. 43. P/O Joseph William Collins, RNZAF NZ424969 – Rear Gunner. Witting crew. Do you know when the photo was taken. My father was part of Brumwell’s crew, which arrived on 27 may 44. I can confirm that 29 in the picture above is my Uncle F/O John Wallace Downing 136351 RAFVR Navigator Burke Crew. Shot down 23rd May 1944 and buried along with some of the crew including P/O Burke in Heverlee Cemetery Belgium. I can confirm that 10 in the picture is my grandfather Sergeant Thomas ‘Tommy’ Farrow, Rear Gunner on ‘Seven Sinners’ LM266, with the Bates Crew. I have been looking for information for many years and have finally found it on this fantastic website!